How often have we left it too late, we are suddenly under pressure. We need to get to that critical meeting and we take risks, or we simply just left it too late, so we ‘run the red light’. If we get to this point we are not just the ones in danger but we more than often involve others in this stupidity, with potential serious consequences for all involved. Organizations so often leave their own futures to the last minute by failing to recognize or acknowledge they are running out of time, the situation they have been so use too for such a long time has suddenly changed. Well, for the vast majority, there was nothing “sudden” about it, they simply left it too late, ignoring all the warning signs and they decided to cross that “red light” as a last minute panic to catch up and be back in charge of their innovation destiny. Often all organizations want to do is get back in control, revert to being comfortable, managing “as usual” but in the process have missed so much innovation opportunity in these panic moments because they did not plan for it. They just had a simple failure in not anticipating and thinking ahead, they “ran the amber”, not being alert to their surroundings and wanting to learn so as to adapt to changing conditions. Not being open and receptive to reacting and exploring, in different more flexible ways, they simply have no time to manage changing events, they are suddenly out of their comfort zone. They spin out of control and lose all traction. It doesn’t matter if it is driving a car, positioning ourselves to receive a pass on the football field we all need to anticipate, to be aware, to get into this ‘heighten awareness’, into the position to “receive”. Otherwise, we are often left as the suckers or the ones that deal with the after effects. So why is it, that organizations’ are so poor at developing heighten awareness? As we appreciate “heightened awareness” is the idea of “having a higher appreciation, knowledge of, and consciousness of your connection between the physical plane, and the spiritual plane”. Or in organizations speak, knowing what is going on, both inside your organization and connecting it to the market place. Heightening our awareness for innovation needs consistent renewal and anticipation, being alert to changes taking place in and around in our environments. It is in this “heighten awareness” we can bring together observation and listening skills from what we can gather from the market place. Often in this state we are discovering unmet needs, jobs-to-be-done that customers need solutions for. You can’t achieve this if you are not alert and clearly drawn into yourself, often in the mistaken belief you know. You know what it takes, how long it takes and you simply relax and suddenly you are caught out, as you cut corners and get caught out by others who have taken the time and invested in this “heightened awareness” plane and thought through their innovation journey. These are the ones who don’t need to ‘run the red light’ as they allowed enough time to be totally aware of their environment and found innovation opportunity on each street corner, because they were alert to what was going on around them. They not only planned the journey, they took the time to enjoy and remind themselves of why they were travelling in the first place, not just to get to the next destination as quickly as possible but to get there through appreciating the how, where and what as their contribution to improving “things”. When we simply get caught up in our day-to-day lives, our world, our needs, we disconnect and then we again, simply, ‘run the red light’ as we need to suddenly, simply, just catch up but often it is just too late. We do need to be so much more proactive. That is so easy to offer as a “catchy” solution as we can’t add a further one hour into our crowded days so easily but it is strange but whenever we are “proactive” we are stopping, reflecting and starting to structure our days far more consciously. We confront face-to-face that running out of time, that flirting with danger by “jumping the red lights.” We begin to systematically break down short and long-term organizational needs based more on what is going on all around us, so we can lessen the pressures, heighten the understanding and simply allow more tuning in to innovation opportunity that is on that “every corner”. This growing awareness begins to “process” the vast number of variables that must be analyzed before a true solution can be delivered because we have allowed some thinking and experimental time and worked out the journey a little bit more. Our minds actually unclutter as we sort our thinking and build in more proactive. Innochat, (www.innochat.com) a weekly one-hour, highly fast paced “twitter chat” that goes on each week on Thursday, is a place for anyone who cares to contribute to the innovating topic of that week, and in this past particular week we discussed curiosity. In writing this post I made a further connection in my reflections from these exchanges. Let me explain, Drew Marshall, who facilitated this session, offered a “framing post” around curiosity and one point just struck such a cord for me here: Curiosity in Intersections – the way in which thinking between subjects leads to innovation. In Drew’s blog piece he talks about multi-switching where we need to recognize patterns and discern what these mean. In Drew’s view it is the innovators ability to rapidly switch from one area of curiosity to another. Then he discusses multi-tasking as something potentially different. In multi-tasking an individual is moving quickly from one activity, or task within an activity, to another. Drew points out that the multi-tasker’s brain cannot fully focus when multitasking and therefore takes longer to complete tasks and they are predisposed to error. We are caught today in a world of multi-tasking and as this seems to be quickening so perhaps we are more “predisposed” to increasing error. We are running the red light more often. We can’t stop the need to multi-task otherwise we just get left behind but we can stop and think more of the “what if?” to anticipate, to be more alert, to raise our heightened awareness. As we cross intersections we do need to be far more aware of the connections, not just of the dangers but of the emerging possibilities. Organizations need to be alert to the dangers of multi-tasking for this risk of increased error. We do need a “heightened awareness” of what innovation means and as more multi-tasking, more projects are being pushed on existing “everyday work” the risks of “running this red light” is increasing rapidly. If organizations continue to “push” even harder, then they run the danger of risking more than they expected. More crashes leading to more crisis, to then be managed and then missing out on the alternatives that time helps to allow. Allowing little time to be aware, to be inquisitive, to spend time investigating, discovering and listening to your customers means you are ignoring the ‘amber’ warning light and suddenly and too late you cross the red light, where you are in real danger of a critical crash- a crash where people leave, because they can’t stand the ‘fear’ or ‘ignorance’ anymore, the fact that there is a new juggernaut crossing your intersection at the same time and you didn’t see it coming and it smashes into you and the result can be fatal. We must recognize for innovation to thrive, you need to allow time, you need to be fully aware of where the possibilities might be and they are often on every corner. Just don’t cross the red light, rushing to get somewhere and you miss all the positive signals around you and also don’t allow enough time to sense the dangers that might be coming towards you from every direction. Arrive safely by driving appropriately. I saw a quote:“I think that growth and spiritual awareness come in slow increments. Sometimes you don’t know its happening”- Mariel Hemingway. I would argue those that seek and plan, that allow appropriate time and be responsive to others needs, will find “awareness” can come not just in these “incremental moments” but in powerful innovative “waves” due to this heightened awareness. None of us should run the risk of crossing on a red light when it comes to thinking about innovation, always feeling under pressure, desperate, we must allow innovation to “arrive” through the space and time needed for allowing those illuminating moments to (ful)fill your innovation journey. I’ve been reading a fair amount recently about the “lack” of innovation leadership within organizations. Where there is smoke there has to be fire I suspect, but does it need to be so? Internal leadership of innovation suffers from exactly the same critical problem that the people working on innovation suffer from, of a lack of time and opportunity to study alternatives, as all are caught up in ‘driving’ their innovation through their internal system. This “alternative voice” is often missing and this can so easily come through external advocacy. This is unlikely to come from the innovation consultant brought in to undertake ongoing work as that is very different, this is more critical, more specialized, even strategical supporting role, involving peer-to-peer engagement. This peer-to-peer helps explore those critical issues relevant to you and where your organization is. Its aim is to offer a different perspective, so as to alter opinions or build new insights, that often cannot be evaluated without considerable deflection from the daily managing innovation that is taking place in often complex and challenging situations.Yet alternatives need to be considered so knowledge can evolve. Finding a depth of knowledge offered by others can save serious time in considering appropriate alternatives or simply further strengthen your existing innovation understanding. It is an option that needs real consideration. This can come from a more ‘traditional’ coaching approach that is seeking behaviorial difference but I think this needs to be extended and deepened further into managing intevention points selectively. 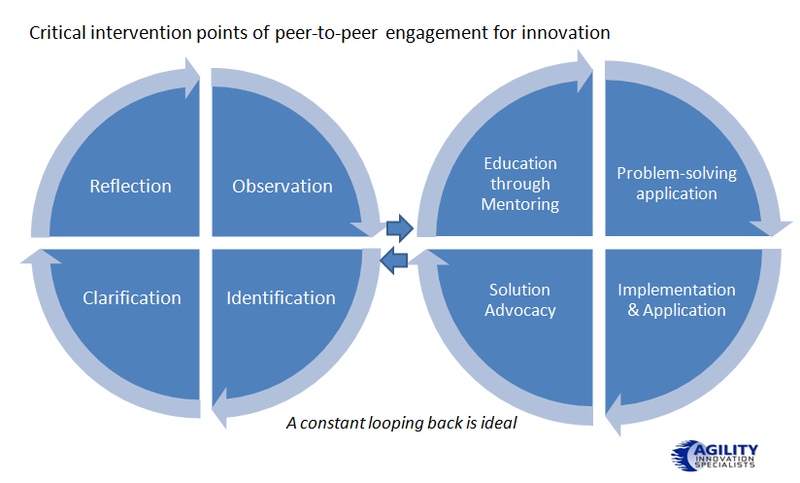 Let me offer a suggested framework that supports this use of engaging with external innovation expertise in peer-to-peer interventions for advancing innovation alternatives. 1. Reflection: often within your own organization you might lack a sounding board to your innovation thinking. Sometimes, actually far too often, advice that is ‘freely’ given may have its own personal agenda, so it is useful to find someone who can demonstrate that they do understand your perspective and are capable and able, to discuss this thinking out loud in a more open, unconstrained way. This resource can really offer a valuable contribution to enhancing your views, challenging ‘set’ positions and strengthen a broader perspective. 2. Observation: this seeking out opinion can often throw into a much sharp focus what you are capable of doing well and what you are missing. Often this is sometimes better to come from an external view point, which can provide feedback from a set of critical questioning. The aim is to aid you in revealing some crucial gaps and can provide a timely, relevant perspective to avoid potential pitfalls and add value through this independent observation assessment. 3. Identification: it can also be highly valuable in engaging someone in exploring the intermediate steps of all the available options. This provides a valuable objectivity at a critical stage within developing innovation capability. That advice then can help you work through these evaluations and stimulate potential alternatives, often hidden from immediate view or not considered fully enough. 4. Clarification: The values of having some form of external benchmarking and growing awareness of best practice across different industries really can help significantly change your thinking. Within these parts of any discussion this can provide you with a broader understanding of the critical gaps, competitive forces and the alternatives that are valuable to be aware of, across industry and where there is possible adoption within your own circumstances. The value of knowing also ‘emergent best practice’ is also highly useful, often not gained by internal perspective alone. These can come from across industry, or further afield in different geographic application, to stimulate your thinking to fascinating alternatives, fresh insights and new practices and paths to follow, that can contribute to a stronger and often unique competitive position. Each of these four activities in peer-to-peer discussions can significantly advance your knowledge and belief in managing innovation far more robustly than normally otherwise. They trigger and stimulate and can be enormously useful to the leadership of innovation within organizations and on a personal understanding level. 5. Problem‐solving application: often within your teams there is a rich knowledge but sometimes it has become too internally focused and lacks that ability to see the broader external perspective and alternatives that we feel an independent voice can bring into the equation. Also external help can offer expertise, resetting the momentum within project or the management of innovation that provides a deeper expertise and contribution that is not immediately available within the organization. 6. Educating through mentoring: often general training fails to transfer that essential and appropriate knowledge back into the organization as it lacks expertise in a given area. This lack of embedding through the application of immediate practice can lead to a absence of personal identification and lose of time. There is a real value in looking for external mentoring for correlation to we look what training should provide by working to achieve specific outcomes on the job, therefore firmly fixing the theory with the practical. 7. Solution Advocacy: the key to successfully external advice is not just in the recommendations and guidelines but the critical part is the issue of transferability into the real world and working through the implications this brings. Encouraging external involvement at this stage, not to do your own teams jobs but to champion and advocate, does greatly aid and increase the value and satisfaction from the engagement, from all perspectives. It provides the increasing ‘knowledge return’ on any investment in your innovation activity by deploying external resources to ‘critical moments’ or activities that need supporting at those vital times, to give it additional momentum. 8. Implementation & Application: supporting the innovation solutions is often the toughest part that needs that extra energy and understanding. Execution is often extremely hard to undertake and often lightly regarded as a normal part of everyday occurrence. This is far from the case. It needs dedicated resources and increased specialisation. It is often forgotten that it is only at this stage you begin to have a return on your investment, entering the market place and nothing is realised from all those internal efforts until this part is executed. 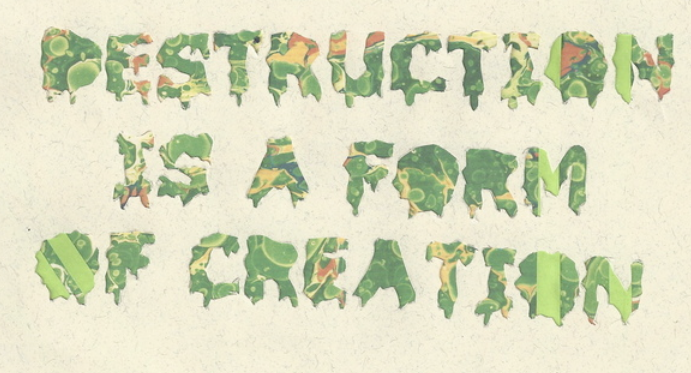 Execution is critical to strategy so as to make it successful and realizable. Applying additional resource and expertise can offer real value. Executing the go-to-market strategy well can add considerable gravitas to your value and to your organizations perceived value. Previous ‘invested time’ in peer-to-peer engagements cannot be more actively demonstrated at this point. Applying knowledge gained in having the external provider assisting and making interventions at those most opportune execution moments can be highly supportive by raising critical issues, that it is sometimes hard for internal parties to make, without some personal concerns on the implications for often themselves. A cautionary warning: you are paying to listen and learn- do! In all of these interventions I’d only ask that you resist ‘shooting the external messenger’ until you have heard the important message he or she is delivering, it might really make the difference between innovation success and failure. It would be a real pity if you lose a wonderful ongoing external resource that’s value is seeking out and extending their innovation knowledge so you can benefit. They can be positioned as an advocating source to the many ‘alternatives’ that are certainly available, that you,due to your role just have limited time to explore. I’d recommend you leverage this resource, nudge, nudge. This specialised innovation knowledge provider can suppliment and nourish your innovation appetite to build on what you already know. It augments what you often don’t have time to evaluate yourself.